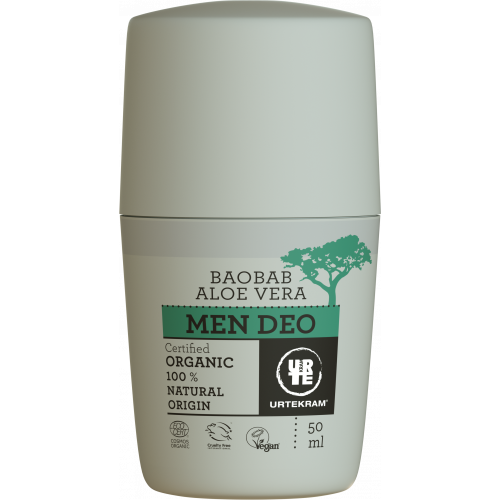 Cream Deodorant with a fresh masculine scent of juniper contains a powerful combination of organic baobab, liquorice and aloe vera. Aloe vera to help calm and regenerate. Baobab, liquorice and zinc ricinoleate to protect and deodorize. 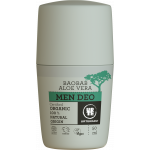 This deodorant helps with the challenges of an active life and provides daily care. Ingredients: Water, aloe vera*, triethyl citrate, almond oil*, vegetable oil products, glycerine**, shea butter*, corn starch*, zinc ricinoleate, jojoba oil*, liquorice root extract*, baobab extract*, hyaluronic acid, hexapeptide-11, perfume, polysaccharides, magnolia bark extract, vitamin E. * = organic ** = made using organic ingredients. We perspire for two reasons - to reduce the body temperature, and to discharge toxins. Body odour may be a result of perspiration produced and many people choose to combat this by using a deodorant. Most deodorants, however, contain chemicals which are bad for us and may be bad for the environment. Commercial chemical deodorants contain other toxins too. All these toxins enter the body when you apply it to the skin. This can actually cause the body to perspire more in order to expel these toxins, thereby causing a 'vicious circle' effect. There are also many controversial chemicals in anti-perspirants and deodorants that many believe are linked to breast cancer. Enjoy the magical scent of thousands of roses, while bacteria and bad odour are a thing of the past with natural mineral salt. In addition to this, your skin is cared for with glycerine.Ingredients: W.. Enjoy the magical refreshing scent of limes, while bacteria and bad odour are a thing of the past with natural mineral salt. In addition to this, your skin is cared for with glycerine.Ingredients: Wat..
No perfume at all! Just natural mineral salt, saying adios to bacteria and bad odour. In addition to this, glycerine provides care for your skin.Ingredients: Water, glycerine**, crystal, polysaccharid..
URTEKRAM® Coconut Cream Deodorant with organic virgin coconut oil and hyaluonic acid naturally deodorize and at the same time nourish and moisturize normal skin. And in addition it has a wonderful sce.. This Naturally Antibacterial Lemon Fresh Deodorant is Aluminium FREE and is formulated with Natural Preservatives. It contains 97% premium quality colloidal silver as a natural antibacterial, antimicr..